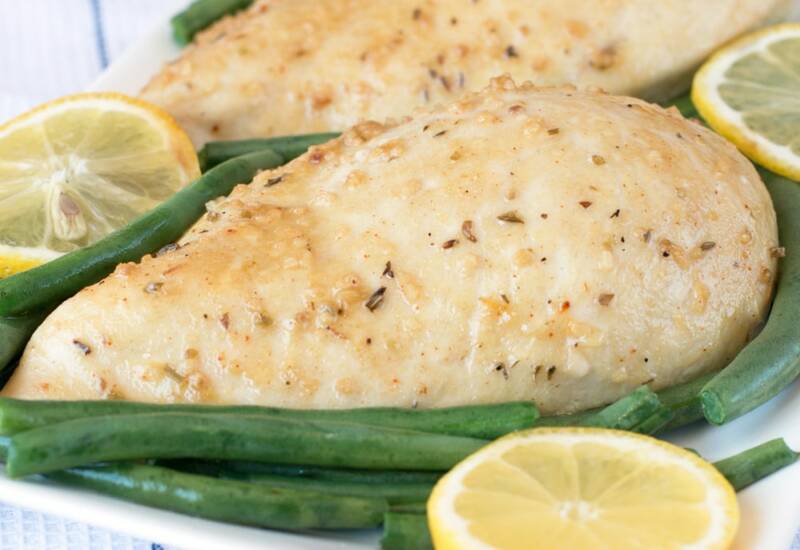 Make this easy one-pan chicken dish for a healthy date-night dinner! This recipe features a tangy and sweet glaze spread over juicy chicken breasts. They are roasted to perfection and served alongside simple lemon-accented green beans. In fact, they are all baked together in the oven on the same baking sheet. You’ll have a colorful and healthy dinner ready in about 45 minutes! What's better than that? Try asparagus or broccolini instead of the green beans for a different vegetable option. Lay a few sprigs of fresh rosemary or oregano over the chicken for the last part of baking for a fragrant, herbal flavor. Make a side of fluffy white rice and you've got a full plate. Pour a glass of red wine to round out the meal! Per Serving: 605 calories; 37g fat; 31.2g carbohydrates; 41g protein; 133mg cholesterol; 764mg sodium. Really liked the taste of the sauce for this recipe, the green beans were a great combination to the chicken. Okay.... this recipe is crazy unbelievably good. I doubled the recipe and our small family still devoured all of this. This recipe delivers super juicy chicken, a delicious sauce. I did broccoli florets rather than green beans and it was amazing. This is a new favorite at our house! Thank you so much. Winner, winner, chicken dinner! The chicken is moist and the green beans are just right. Great everyday dinner recipe with a delicious marinade! I've had this recipe bookmarked but I just bought a pressure cooker so wanted to try it out. I seared the chicken until golden brown, removed it, then stirred together the glaze ingredients plus 1 1/2 cups of chicken broth in the pot. Added the chicken and green beans back to the pot and cooked under high pressure for 12 minutes. perfect!!!! This chicken dijon recipe tastes just like the chicken recipe that my mom used to make. The one-pan cooking method made for really easy clean-up, and added lots of wonderful flavor to the green beans as well. Loved it! simple and delicious! the glaze was tasty and a touch on the sweet side, definitely not too sweet but I prefer a bit more of that mustardy punch, I'll probably half the honey next time. the chicken is amazing. I would have sauteed the green beans with some garlic and onions. I would suggest making double the marinade for the next time because there will be a next time. Yummy!! Really fantastic and easy meal! Juicy and delicious as is, but would definitely recommend making extra sauce because it's just so tasty! !